On the 18th of September the members of the Parliament Committee association between Ukraine and European Union came on a business visit to the University. The guests began their visit with putting flowers to the honorary monuments of the teachers and students who died struggling for the independence of Ukraine and also honored the memory of the university student, the hero of Ukraine, Roman Huryk who came to a tragic end at Euromaidan in 2014. 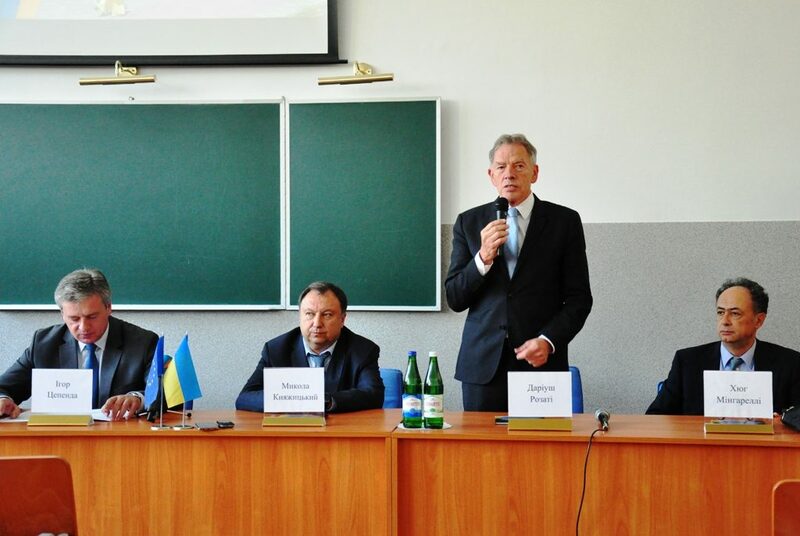 They later met with the students discussing the relations between Ukraine and European Union and further prospects of the realization of the association treaty “Ukraine-EU”. Mykola Knyazhytsky, peoples deputy of Ukraine and the member of the Parliament Committee association and Dariush Rozatti, also the member of the Committee took part in the discussion. This is the first visit of such a delegation from the European parliament. They also mentioned active participation of the students and teachers in the realization of the educational program EU Erasmus+. Much was said about hard work on the fulfillment of the treaty between Ukraine and EU. The deputies were informed about the work of the University, the international projects were presented. A special attention was drawn to the modern pedagogical project MO-PED. At the end of the visit the students gave thanks to the members for coming to Ukraine and getting some new information about the international cooperation with the EU and further opportunities to have a learning practice abroad.